The Museum of Latin American Art (MOLAA), in Long Beach, California was established in 1966. 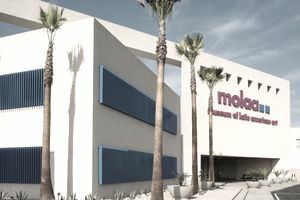 MOLAA's permanent collection of Latin American modern and contemporary art includes over 1,300 works of art - "painting, sculpture, works on paper, photography and video—by more than 350 Latin American artists from the 20 Latin American countries included in the MOLAA mission." The Museum of Latin American Art in Long Beach, California was established in 1966 as a museum dedicated to modern and contemporary Latin American art. Located in Long Beach, California, the museum also includes the diverse Los Angeles community as part of its audience. As of 2015, the Museum has expanded in size and has added a sculpture garden which is 15,000 sq. ft. The Museum is located in the East Village Arts District and occupies the site which was once a famous silent film studio named the Balboa Amusement Producing Company. In the 1920s, the film studios were replaced by a roller skating rink called the Hippodrome, which now houses the Museum. "The Museum of Latin American Art expands knowledge and appreciation of modern and contemporary Latin American art through its Collection, ground-breaking Exhibitions, stimulating Educational Programs, and engaging Cultural Events. " The Museum of Latin American Art is located in Long Beach, California. Please refer to the Museum's website for further directions and information. The Museum of Latin American Art has a permanent collection, so from time to time may require the services of an art conservator in order to preserve the works for future generations. The Museum's collection includes artworks by artists such as Rufino Tamayo, Leonora Carrington, Los Carpinteros, Wifredo Lam, and Félix González-Torres. Please note that crafts and folk art will not be considered, but only modern and contemporary Latin American art will be given careful consideration by the curatorial department. The Museum regularly posts job listings on its website in the various departments such as administrative, collections, curatorial, education, library, marketing and public relations, sales, security, etc. when jobs become available. To apply for a position at the Museum, applicants can submit their cover letters and resumes to the Museum. The Museum of Latin American Art, 628 Alamitos Avenue, Long Beach, CA 90802. Tel: 562.437.1689.